Despite most beauty bloggers already reviewing these I thought I'd put my say in. These were one of the most anticipated beauty releases for 2013 and as soon as they arrived people dropped everything to rush to the nearest Boots. 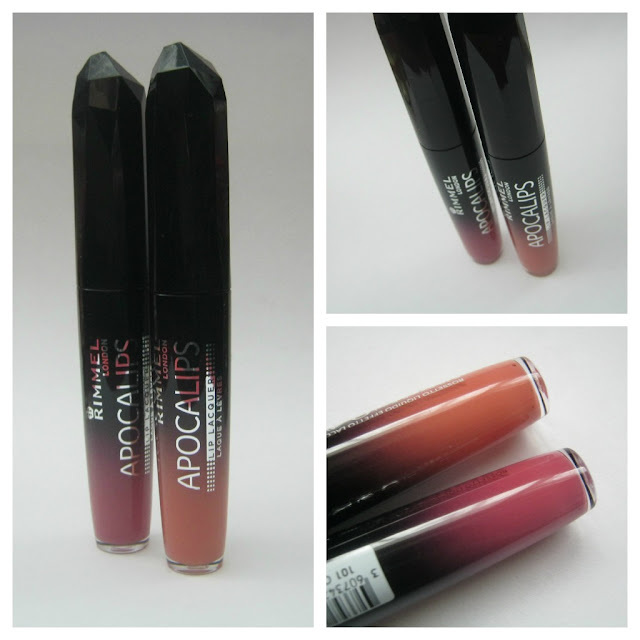 What made me buy them is that they *seem* to be similar to my much much loved MUA Intense Kisses Glosses. However, after trying them out I can tell that there are quite a few differences between them. I have the shades Luna, which I brought from a blogsale, and Celestial. Luna is a peachy orange shade and boy is it in your face! To reach by desired look I applied the tiniest amount of it, blended it with my finger and then blotted with some tissue. I did exactly the same for Celestial which is a dusky pink shade. These are VERY pigmented products and you really don't need much. This is a positive thing but it means it takes longer to apply the product than just your normal lip gloss/lipstick, you certainly wouldn't be able to apply this without a mirror! These last about 3 hours on me before I have to re-apply, I'm happy with that time length considering Apocalips are lip lacquers so they aren't meant to last as long as a lipstick would. They are a little drying on my lips but I suspect that's partly due to the fact I have VERY dry lips all year round and most products are a little drying on me. One thing I have to mention though is the god awful smell that flows out of the product when you open it. Its a very sweet and sickly smell and whilst some will like it its definitely not to my taste. However, it doesn't smell when its on your lips which I was relieved to find out! Overall I would recommend these and I would purchase more but I don't think they are as perfect as some say. What do you think? Did you find any faults? I completely agree with you, I wanted to love these so much but I just can't! The transfer is ridiculous, I also found them drying and don't get me started on the smell! I got Celestial and I really like it! Pigmentation is great.